David fights the future. Season Finale. David Haller, AKA Legion, is a troubled young man who may be more than human. Diagnosed as schizophrenic, David has been in and out of psychiatric hospitals for years. But after a strange encounter with a fellow patient, he’s confronted with the possibility that the voices he hears and the visions he sees might be real. 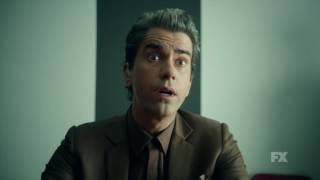 Currently you are able to watch "Legion" streaming on Sky Go, Now TV or buy it as download on Sky Store.